Texans like to brag that everything grows bigger here. While some of these boasts might be stretching the truth just a little, there are things Texans can rightfully claim as grandiose, and one of them is catfish. Living proof of this dwells in the aquarium at the Texas Freshwater Fisheries Center in Athens. That is where Splash, the 121.5-pound, world-record blue cat caught by angler Cody Mullennix last January, entertains visitors on a daily basis. Anglers dreaming of catching a Splash-size catfish, or at least one big enough to brag about, have many options in the Lone Star State, where excellent catfish action abounds in every region. Let’s take a look at some of the unusual methods anglers in Texas’ use to catch these trophy cats. Be warned: Some of these tactics may seem downright weird, but with catfish, that tends to come with the territory. Over the years, I have cleaned cats that had ingested everything from bream to blue crabs. It should come as no surprise, then, that catfish can be cannibalistic, especially the highly predatory flathead. In fact, when anglers in Southeast Texas want to score on trophy-sized flatheads, they exploit these cannibalistic tendencies. No, I am not talking about putting flatheads or even blue or channel cats on a hook. That would be illegal since those species are game fish. I am talking about using bullheads or “mud cats,” as anglers call them in many areas. The law does not protect yellow, brown and black bullheads, meaning anglers can legally use them as bait and, according to Lewis Hogan of Orange, there is nothing better for big flatheads. “Ask anyone around here who runs trotlines what their favorite bait for big flatheads is, and they will all tell you: mud cats,” Hogan says. Hogan catches bullheads in perch traps or on rod and reel in the backwaters in the spring and, when setting his trotlines, hooks them through the lips and hopes a big flathead does not break them off. “I have had numerous break-offs from what I suspect are really big cats. I rarely catch any less than 20 pounds using mudcats for bait and have caught them up to 60 pounds,” he adds. Another method that may seem strange but that works quite well is “flipping” for catfish. Many anglers know largemouth bass and crappie hold tight to brush that runs along shorelines of rivers and reservoirs, and so do catfish. This method is one I discovered by accident a few years ago. I was field-testing an underwater camera system called the Aqua-Vu, which allows anglers to look underwater from the boat, when I came across a bunch of big channel cats in an extremely clear section of the Guadalupe River near Kerrville. I did not have any catfish bait, so I rigged a heavy jighead with a pork rind and flipped it on the edge of the brush toward the fish. I ended up catching only two of these fish that day, but there were far more down there. The best spot to look is near brush that rests on a ledge at the end of a point near a creek channel. This is especially true at night when catfish often move from the deep to the shallows to feed. Shad stack up in these areas, which in turns draws in the catfish. By flipping a piece of cut shad or a live crawfish rigged on a 1/2-ounce jighead, it is possible to catch good numbers of cats. A few years ago, Texas Angler television host Keith Warren told me of a similar method he has used that involves fishing a dead shrimp or other bait on a Texas rig without the worm around brush and other structure. He says channel cats will take to moving baits. The natural tendency is to think of catfish going for something that is still, but something with a little movement can get their attention. Lake Sam Rayburn guide Roger Bacon turned me onto some outstanding brush fishing for cats by accident back in the summer of 2000. While fishing with him for crappie over manmade brush piles, I caught a couple of channel cats along with some largemouth bass and figured out quickly that cats hang around brush just as much as any other game fish. Anglers know manmade brush is good for crappie because they provide structure and draw in baitfish. Catfish like structure, too, and they, of course, prey on baitfish. This makes brush piles a magnet for cats. Bacon says anglers not familiar with brush pile locations should search the open lake and large coves, looking for submerged marker buoys covered with green slime. “These are the ones some of the hard-core crappie anglers put out and they usually hold plenty of fish,” he says. Some of these brush piles can be quite large, and there is much structure to cover. Anglers should stick with the main brush and not worry about the smaller piles on the outside. Most of the cats tend to stick around the main brush, and if anglers are baiting the brush for crappie or cats, they usually do so on the main pile because it is easier to position a boat over. Out of Texas’ three most popular catfish species, the flathead is by far the most predatory. Anglers seeking these big, aggressive catfish use everything from live perch to other catfish for bait as we detailed earlier. Perhaps the best time to catch flatheads on rod and reel is during the summer at night when they move into shallow waters to feed on the baitfish that congregate there. Veteran anglers claim that the biggest fish usually do not venture far from the deep. Target the large creeks and sloughs that feed into deep areas of a reservoir or river and fish the first 1/4 mile of it. Also, consider fishing any shallow, flat area along a major creek bend that empties into deep, moving water. During summer, the big flatheads tend to stay in the deeper water during daylight hours and move shallow after the sun sets. Most anglers fish with live perch, extra large shiners or goldfish under a lighted cork so they can easily see it disappear when a fish strikes. Something to consider for use at night is a green fishing light. They are popular among coastal anglers and are becoming increasingly common among crappie anglers. Lights draw in baitfish, and the green lights tend to penetrate deeper into the water than standard white lights. Anglers seeking nighttime flatheads could benefit from congregating baitfish in one area, and there is a good chance the bright green light can pique the curiosity of the flatheads themselves. The brackish waters along the Texas coast are overlooked trophy blue-cat areas, especially during cold snaps. Blues have a high tolerance for saltwater and congregate in these locations because of the abundance of easy prey that gathers there after cold fronts blow through. Look for big blues around the points where the bay and river meet on strong moving tides, especially when it is coming back in after a cold front. Many of these spots have washouts created by current, and they are magnets for blues after the first few fronts. Anglers on the Upper Coast believe the draw is the shad that perish from the sudden change in water temperature and the crabs that come to feed on them. Something else to look for in these areas is mussel beds. Mussels are common in river mouths, and blue cats feed on them throughout their range. Robert Vail, a Sabine Lake fishing guide who held the state saltwater blue catfish record for a while, says other areas to target are various points in the ship channel emptying into the bay. 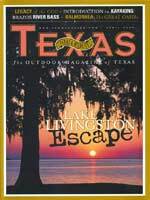 In February 2000, I spent a very cold night fishing with Vail in a canal in the Neches River north of Sabine Lake. Since the canal was originally built to help tugboats turn around, it is deep, but it also has shallow banks that drop off rather sharply. On the fish finder, we found huge schools of shad suspended in the water and had a fairly successful night of fishing. We used small chunks of mullet fished on the bottom both in the deep and along the shorelines right at the drop-off. Most of the fish came from the deeper water, but occasionally one would strike the bait set in the shallows. An interesting phenomenon is that many of these catfish jumped when caught. I have fished for catfish all over the state and have never seen them jump as these did. In fact, I thought the first fish we had on was a gar because of its aquatic acrobatics in the frigid night. When seeking trophy catfish in such extreme conditions, it becomes obvious that patience is important. When mosquitoes are mauling you on a night-fishing venture, or when you are freezing to death in search of big blue cats in the dead of winter on the coast, you have to be willing to wait on the big fish no matter how high the level of discomfort. Trophy catfish can frustrate even the most seasoned angler. There are times when you know the fish are there, yet they refuse to bite. This may become frustrating but will be well worth it when your rod doubles over and the catfish of a lifetime is battling furiously on the other end. That is when adrenaline kicks in and frustration fades to fun. Many Texas anglers fish from the bank. They may not be able to afford a boat or simply choose not to fish from one. This does not, however, mean they cannot catch good numbers of catfish or even trophy-sized ones for that matter. In fact, Cody Mullennix caught his record blue cat from the bank last year on Texoma. With that said, however, bank fishing is limiting and can be frustrating for anglers who wish to go where the fish are. Well, for those seeking catfish, there is a way around this. It involves making the fish come to you. European catfish and carp anglers who typically fish exclusively from the bank use a system called “ground baiting,” which involves putting chum out with the bait. They attach a small cylindrical device above their swivel, which holds chum and dispenses it as the water rushes by. The problem is these rigs are not readily available in our marketplace. However, with a little American ingenuity, a similar device can be made by taking a 35-millimeter film canister, punching a hole in the bottom and on the lid and then punching more holes along the side. This acts as a perfect chumming device and is very inexpensive. Rig this above your swivel and weight, then fill it with your favorite chum. Now you will not only be chumming the area you fish in but also bringing fish directly to your bait. Any kind of chum will work, but a mixture I have had some success with was menhaden oil (available through many mail-order offshore supply catalogs) mixed with soured milo. The oil creates a huge chum slick and when it mixes with the milo, the smell is almost unbearable, which means catfish love it. The best part is that a little bit goes a long way. Something else to consider is using jack mackerel as bait. This oily fish is available in larger supermarkets in a can for less than $1, and I can attest it will bring in fish. While fishing in the Gulf of Mexico and tagging sharks for the Mote Marine Laboratory, my partners and I were able to chum in and catch nearly 40 sharks while using less than two cans of the stuff. It is oily and stinks to high heaven, so catfish should love it. For anglers interested in using film canisters to chum their bait, something else to consider is the use of a popping cork. Even if your bait is on the bottom, you can rig a popping cork above it and attach a baited film canister below. This will allow you to do some extra chumming and use the cork to “pop” the chum out whenever you want to release more. Last summer I tried using one of these in the surf near Port Arthur and had a shark come up and attack the canister attached to the cork and cut the line. Catfish will probably not be that voracious, but you never know what will happen on Texas waterways. That is the fun part.